Using yarns whose colors clash – meaning they have much stronger contrast than you’d like – can be a challenge when designing your own handwoven cloth. It’s easy for them to weave into fabric you dislike. But it’s not that hard to harmonize colors that don’t “go together”. 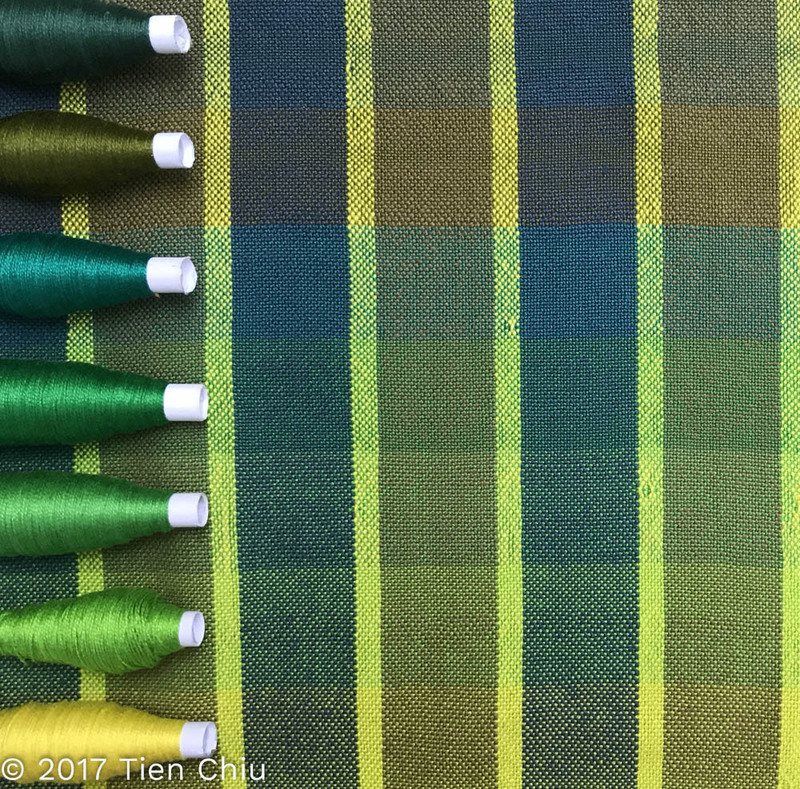 This blog post will show you how to use “clashing” color combinations to make beautiful handwoven cloth. Once you understand why colors clash, the solution becomes clear. You can smooth the transition between the colors by adding a third color in between, one that harmonizes with both colors. Or you can blend both shades with a color that reduces the contrast between them. 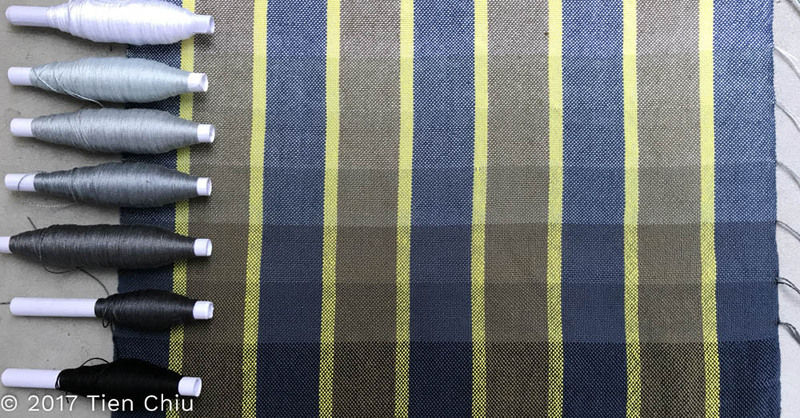 The easiest way to fix clashing colors in your handwoven cloth is to pick a color that is compatible with each of the two jarring colors, and insert it between the contrasting shades. Neutral colors – black, gray, and white – are often used as buffers, because (being neutral) they don’t clash with any other colors. However, colors that fall between the warriors on the color wheel, and in lightness/darkness, can work as well. However, inserting turquoise to separate the two colors results in a far more harmonious design, because it falls between the lime green and the purple, both on the color wheel and in lightness/darkness. 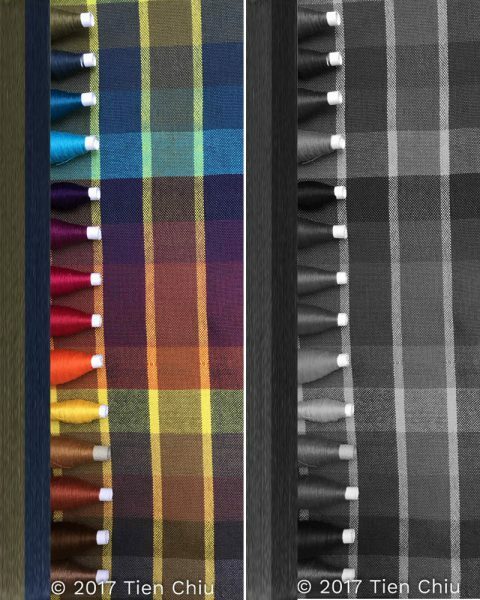 A second option for creating beautiful handwoven cloth from clashing colors is to reduce the contrast in the colors by mixing them with a third, carefully-chosen weft color. Plain weave is best for this, as it creates the smallest dots of color and thus mixes the colors together more thoroughly when seen at a distance. (More about optical mixing in my blog post “How to use black to give your handwoven fabrics pizzazz“.) But any structure with short floats can work too. To pick a weft color, you need to consider how much of each color is present and what will blend best with each. 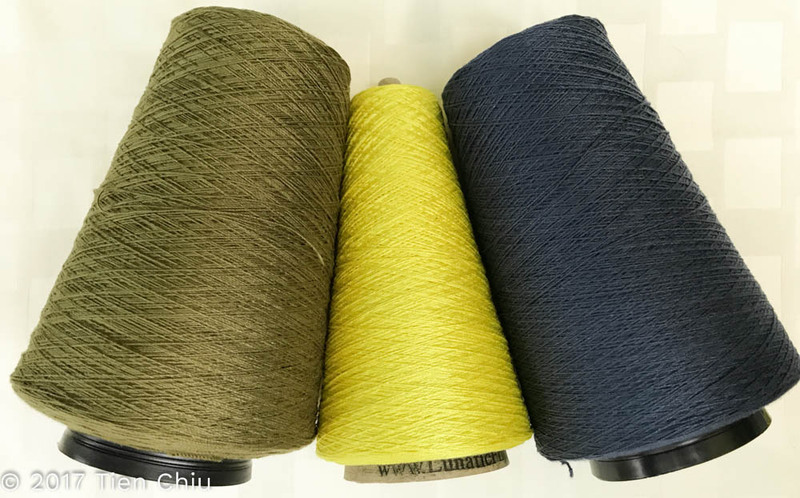 In general, you’ll get more harmonious results if you choose a weft color that is similar in darkness to whichever color makes up most of the warp. It’s also helpful to choose a color that is close on the color wheel, or which is similar in brightness/dullness. Here the clashing purple and yellow warp stripes are unified by a green weft, which falls between purple and yellow in darkness, and on the color wheel. To see how this plays out in real life, let’s look at an example. These three yarns are from my stash. This reduces the contrast, but also loses the vitality of the original version. Since the blue and olive make up most of the design, we need to start by finding a weft that will blend harmoniously with both. The most important part is to choose a color that is similar in darkness to the blue and olive. 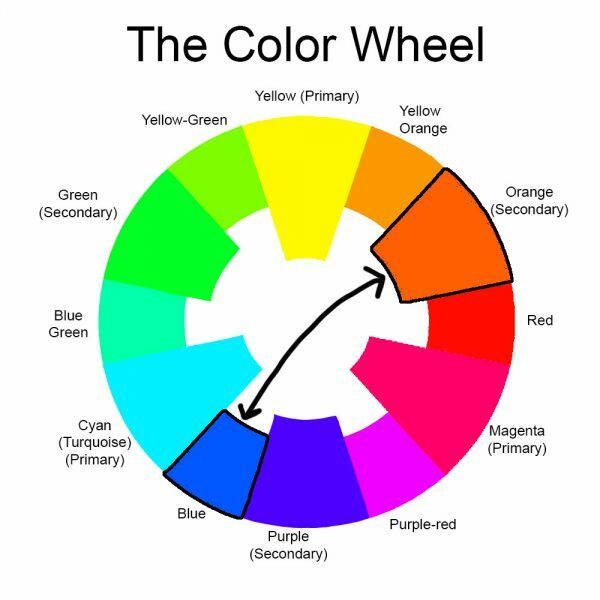 It’s also helpful to choose colors that fall between blue, olive, and yellow on the color wheel. As you can see, the darker grays blend better than the other colors because they are almost exactly as dark as the blue and olive, so there isn’t much contrast between them. But they darken the yellow, making it more compatible with the blue and olive. As you move higher or lower in the gamp, the contrast between the warp and the weft becomes much higher, giving a spotty-looking, less unified fabric. Next, let’s look at colors that fall between blue and yellow on the color wheel. While most of the greens work reasonably well, the top four give noticeably more even results than the other colors. That is because they are just about as dark as the blue and olive, so they blend harmoniously with those two colors. And, of course, they darken the yellow and shift it towards green, which reduces the contrast between the yellow and the blue/olive. 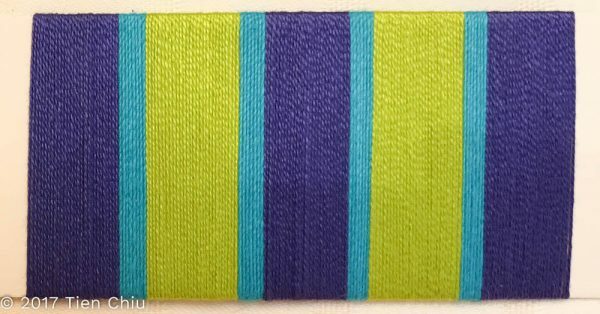 Because the blue and olive make up most of the piece, and blue is the color that clashes most strongly with yellow, using a weft that is about as dark as the blue produces the smoothest-looking results. For wefts of similar darkness, the blues and greens are most compatible, but good results can be had with other colors, such as the reds in the middle and the browns near the bottom. The best way to use clashing colors when designing handwoven cloth is to add a third color, one that harmonizes with the other two. While you’ll need to experiment, usually this color falls between the two clashing shades, both on the color wheel and in lightness/darkness. 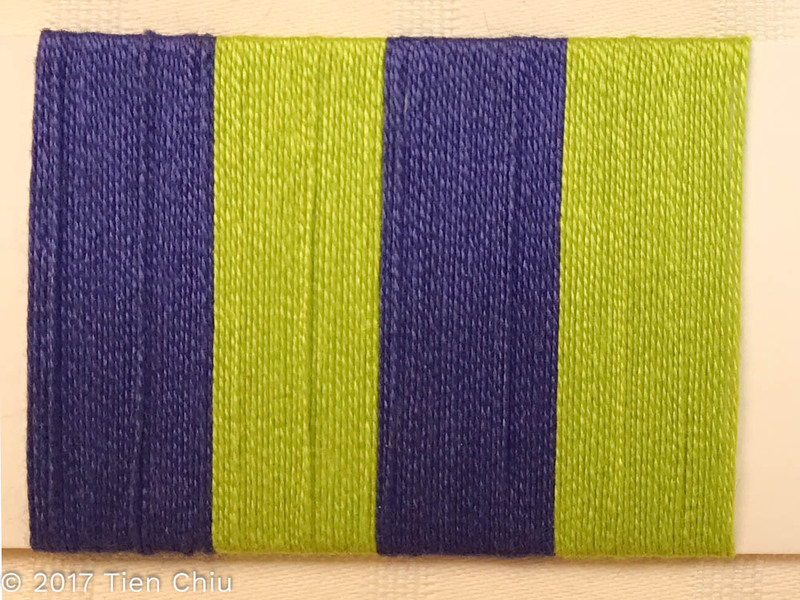 I hope this blog post has given you some ideas of how to tone down clashing colors! 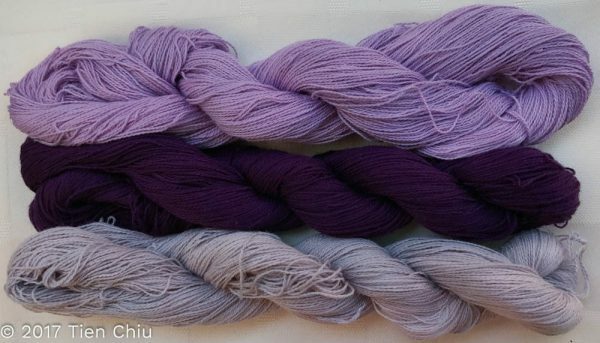 One of the biggest barriers to stash-busting is how to use colors that “don’t go together”; I hope this post enables you to overcome that, and use whatever colors you like. Question: how to make an attactive weave using a dull, maybe ugly color? Thank you for this wonderful post. As a graphic designer I’m used to work with colors in 2D, on paper. I find it very difficult to pick the right colors for my weavings. I love ‘sea’ colors, blue, greens, pastels. I’m not so fond of using orange and brown because they are not my kind of colors. How can I use ‘my’ colors ? As they are pastels, all look dull. But basically the way to fix it is to add a few dark and medium colors to the mix. You don’t need to use a whole lot of the dark and medium colors, just enough to give some contrast to the weaving. The problem is that pastels are all about equally light, so the eye can’t tell them apart at a distance, and the cloth looks bland. (Because we have way more black/white receptors in our eyes than color receptors, we see black/white differences much more clearly than differences in color.) 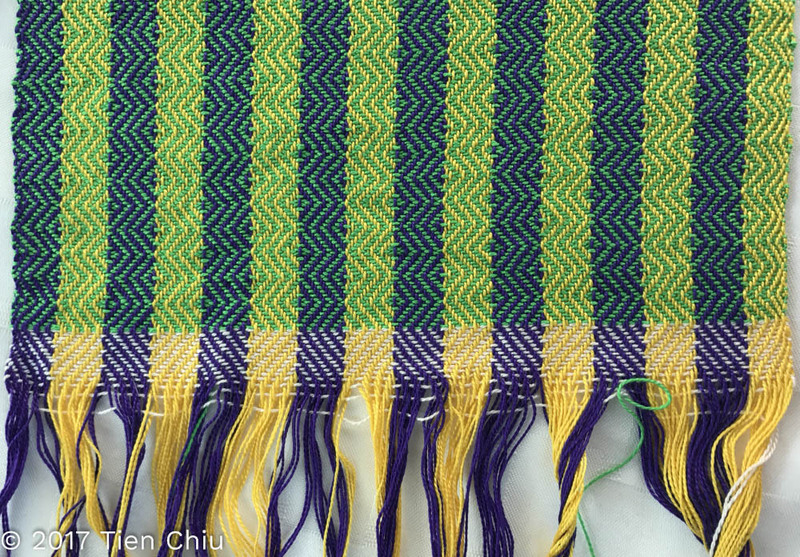 Adding some darker colors will help pep up the weaving. Another approach is to add just a tiny bit of an opposing color – yellow-orange-red and the darker shades of those colors (olive green, brown, brick red)- maybe a thread or two as accent, or a small area of pickup. That adds color contrast (and thus excitement) too. But if you’re not fond of those colors, try adding some darker shades of blue/green first. The basic principle is that the more contrast there is in a woven piece, the more exciting it will look. Contrast in value (light/dark) is most important, followed by contrast in hue (color family), and finally contrast in saturation (bright/dull). So if you think your piece looks dull, add something that will increase the contrast. thank you so much Tien for explaining this in a very understable and clear way ! The explanation and photos are so very helpful. Thanks!! You have a huge fan here. I have always struggled with color. Nothing looks like the image in my head and as a new weaver, it’s become even more complicated. An earlier blog really helped me rethink my last project – honeycomb pillow covers – and while they’re not finished yet, I am very happy with the colors. This post is tremendously valuable. Thank you for making sense of it for me. Tien.. please define ugly, clashing etc. My favorite colors are cyan and orange.. or blue violet and orange. Here you say they clash.. I do not believe, if used properly, they clash but can enhance each other. For me there is no ugly, there is no clashing, there is no mud.. and all colors can go together IFF you do them with lots of planning. Yes.. all colors can be made to work.. the secret is how you do it! However, colors with extremely high contrast (in the ways I mentioned) will strike a lot more people as “clashing” (i.e., too high-contrast for their tastes). And many people don’t know how to use those high-contrast colors to get the harmonious results they want. So this post is about how to harmonize high-contrast colors. I generally agree that there is no intrinsic right and wrong to color combinations…they just produce different effects. The real question is whether your chosen color combination gives you the effect that you want. 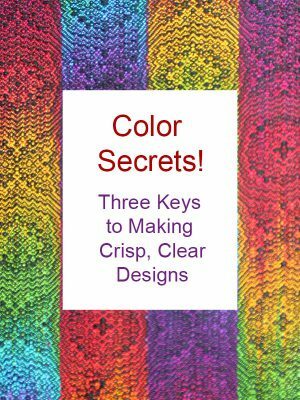 You don’t need to harmonize clashing colors – but since a lot of people want to and but have difficulty with it, I wrote this blog post to show how to do it. 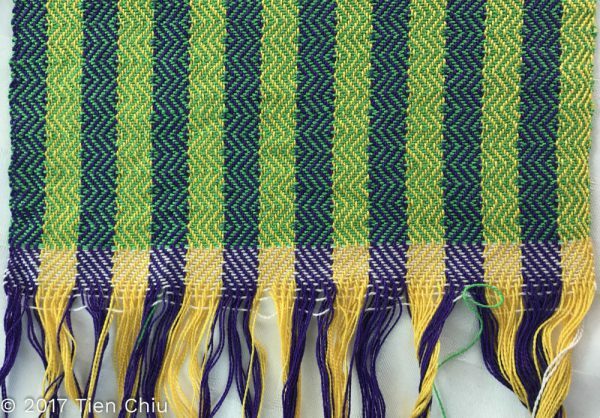 As a beginner weaver I find the color issues to be much harder than the actual step-by-step HOW of weaving. This post is extremely helpful to me. Thank you! Great tips! I’d like to know if you would apply this to a variegated warp as well? Yes, this would work for a painted warp. For a warp wound with variegated yarns (e.g. hand-painted skeins), it’s a little more complicated because the colors will blend where they’re placed next to each other, especially in fine yarns. That will naturally tone them down, possibly a lot. Thank you. This was one of the best and practical articles I have read on this subject. I’ve saved for later reference. Quilter friends use this formula…2 lights, 2 darks and a zinger. It allows for contrast, also using ‘Safe’ colors yet having that spark. Looking at flowers there’s always a bit of orange or yellow someplace. When we step away from our ‘safe’ colors and add the contrasting color…even with just a few scattered warp threads…our work will come alive. Thank you Tien for this explanation. I’ve heard this term called ‘optical mixing’….from a distance it is one color, up close clearly a mix. Colors rock! I’m always blown away by your ability to not only explain these concepts, but to also include such detailed photos of the topic in action on the loom. Thank you so much! I’m glad you’re finding them useful!